1.) 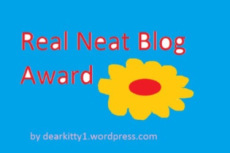 Put the “Real Neat Blog Award” logo on your blog,. 2.) Thank the people who nominated you, linking to their blogs. 4.) Nominate any number of bloggers you like, linking to their blogs. 5.) Let them know you nominated them (by commenting on their blog, etc). 6.) Ask your nominees 7 questions. 1. What drives you to get out of bed every morning? My bio-rhythsm and I am an earlier riser, often get up at 6 o’clock in the morning. 2. Who inspires you the most in your life currently? My Master Sant Kirpal Singh and his Gurmukhs: Dr. Harbhajan Singh and his wife Biji Surinder Kaur. 3. How do you motivate yourself in regards to blogging? I want to share my experiences I have made during my life and what my Master has taught – it is a universal teaching and concerns all of us. 4. What are 3 dreams that you hope to fulfill in your lifetime? b) to become a living example and live thoughts, words and deeds practically as 1 gramm of practice weighs more than tons of theory. 5. Do you have a favourite quote, if so, what is it and why? “Do Good, Be Good and Be One” – it is a quote of my Master, when He was in America during His world-tour in the West and was asked while He was interviewed in a tv-broadcast, to tell in a few words His teaching (this teaching is the teaching of all compentent Masters). This quote includes everyting to become a real human being. 6. What is your favourite song, book, artist, album and movie right now? It is the inner music and vibrates through the whole universe, the whole creation and is called “inner Sound current”. I have to name several books that I like very much: “The dialogues of Kabir”, “The Anorac Sagar” by Kabir, “The crown of life”, “The mystery of death”, “Naam or Word”, “Spiritual Elexir”, “Morning Talks”, “Karma: The law of cause and effect”, “What is spirituality”, The night is a jungle” – are all written by Sant Kirpal Singh Ji – for readers who are very much interested in spirituality these boos are really a treasure. Regarding movie: I cannot tell, as I do not watch so many movies. 7. What are 3 things that make you happy right now? a) To see Kirpal Sagar becoming more and more shining and the time will come that Kirpal Sagar will be a pilgrim place for all religions (as they are peacefully under one roof there ), and human beings – a place that is really unique in the whole world, belonging to the whole mankind. b) I have noticed that more and more people are ready to bear responsibility and become messengers of truth and love, pouring it into the world and sow the seed of a harmonic world in the future – this is my hope too. And we all can contribute to it with our hearts connecting people. 1. )What can you do to make the world better you live in? 2.) What is for you the purpose of life? 3.) What is your hobby? 4.) If you had 3 wishes free what would you wish? 5.) What is most annoying for you? 6.) What are for you the most important virtues of man? 7.) Do you think violence can be stopped with violence or war with war to achieve peace?